(CNN) -- Around 204,000 people have fled their homes in the Somali capital of Mogadishu as a result of a militant offensive against government forces, the U.N. refugee agency said on Tuesday. 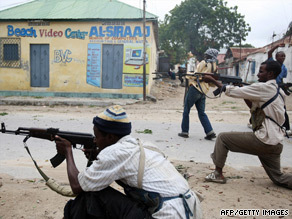 Islamist fighters exchange gunfire with government forces in Mogadishu on July 3. The eight-week long push by Al-Shaabab and Hisb-ul-Islam militias has prompted what the agency calls "the biggest exodus from the troubled Somali capital since the Ethiopian intervention in 2007." "The escalating conflict in Mogadishu is having a devastating impact on the city's population causing enormous suffering and massive displacement," the U.N. High Commissioner for Refugees said. The agency said its local partners in the capital reported that fighting over the past week "has killed some 105 people and injured 382." "Neighborhoods affected by the fighting include Kaaran, Shibis, Shangaani and Boondheere in North Mogadishu. These areas have hitherto been islands of peace, escaping much of the conflict and destruction. Many residents are fleeing their homes for the first time since the start of the Somali civil war in 1991," the agency said. The agency said the number of internally displaced people in Somalia amounts to more than 1.2 million people. There has been growing concern that Somalia, in the Horn of Africa, could be the next base for al Qaeda as U.S. forces pound their positions in Afghanistan and Pakistan. Last month, a U.S. State Department spokesman said the United States is providing weapons and ammunition to Somalia's transitional government as it fights al Qaeda-linked Islamist militants. CIA Director Leon Panetta recently said that the intelligence agency is keeping tabs on the region as a possible destination for fleeing al Qaeda operatives. "Our concern right now is that likely safe havens are areas in the Horn of Africa, like Somalia and Yemen, that are countries that because of their political status can be attractive to al Qaeda in order to operate there," Panetta said earlier this month. Al-Shaabab, also known as the Mujahideen Youth Movement, was officially designated as a terrorist organization by the United States in March 2008. It is waging a war against Somalia's government in an effort to implement a stricter form of Islamic law.